I just saw an 8th grade boys basketball game, the most recent of many I've seen before. But this is the first time I've seen one with a female coach. One test of discrimination is whether the allegedly discriminated group is more productive on the relative few occasions when they are given a chance. The theory is that the discriminated group has a higher performance threshold to clear in order to be employed. If instead the allegedly discriminated group is less productive, then maybe productivity is the reason the group is under-represented in the marketplace. In principle, the same test could be conducted in the market for grade school coaches. It's easier said than done, because value added in that industry is more than merely point margin, but also sportsmanship, learning, parental evaluations, etc. With that said, the two teams were tied at the end of regulation. The female coached team won the overtime by 3pts. The female coach said fewer curse words. Take a look at this video of a discussion between Milton Friedman and David Brooks (and two others). Turn to the 38:15 mark. "The FDA has made outcomes worse, not better"
"Everyone agrees that the minimum wage destroys employment opportunities for poor people"
I suppose this change is correlated with switching his employment from WSJ to NYT? The Great Recession of 2008-9 has brought forth some intriguing claims about public policy and the nature of factor supply. Using “New Keynesian” models to guide the discussion, a number of economists suggest that government purchases might stimulate private spending, rather than crowd it out, thereby increasing total spending more than dollar-for-dollar (Christiano, Eichenbaum, and Rebelo, 2009; Eggertsson, 2009; Woodford, 2010). At the same time, few have evaluated current macroeconomic policies on the basis of the incentives they provide to supply labor and other factors of production. 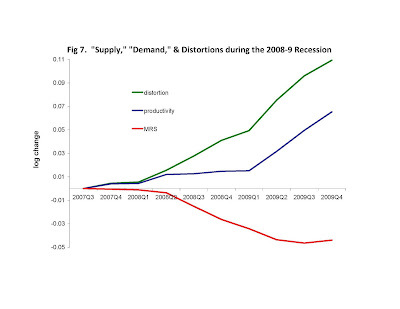 Is it possible that factor supply does not matter during a recession? Or even worse, that our economy suffers from a “paradox of toil:” expansions in factor supply actually reduce aggregate output (Eggertsson, 2010)? Economic theory suggests that the government spending multiplier and the paradox of toil are related, because both involve the (general equilibrium) relationship between factor supply conditions and private sector factor demand. Models with crowding out predict that a reduction in the supply of factors to the private sector – either because the government is using some of those factors or because a distortion causes some of the supply to be withheld – ultimately reduces private sector output and factor usage. One mechanism achieving this result is that private sector employers pass on their higher factor costs into output prices, which causes their customers to demand less. In “Keynesian” models, this pass through doesn’t happen and perhaps even the high factor rental rates feed back to increased demand for private sector goods. One approach to these questions would be to use historical data to measure the government spending multiplier (Barro, 1981; Alesina and Ardagna, 2009; Barro and Redlick, 2009; Mountford and Uhlig, 2009; Ramey, 2009) or to measure output effects of factor supply growth. But it has been claimed that historical output responses to government spending impulses ought to be atypical of those that occur today, because today we are in a deep recession, and monetary policy is fundamentally different than it was in the past (Christiano, Eichenbaum, and Rebelo, 2009; Eggertsson, 2009; Woodford, 2010). Even without the added burden of estimating a separate multiplier for deep recessions, clear and significant shifts in government demand that are economically similar to the kinds of spending proposed in government “stimulus” laws are difficult to find, and thereby difficult to translate into an accurate estimate of the government spending multiplier. 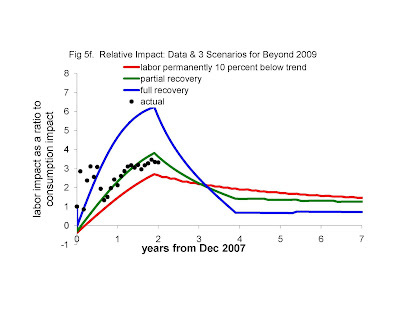 The purpose of this paper is to exploit the close relation between the government spending multiplier and the paradox of toil, and the ready availability of obvious factor supply shifts during this recession, to test the paradox of toil hypothesis. The empirical analysis can be interpreted as a test (of whether government spending stimulates private spending) that is admittedly indirect, but not reliant on the historical data. 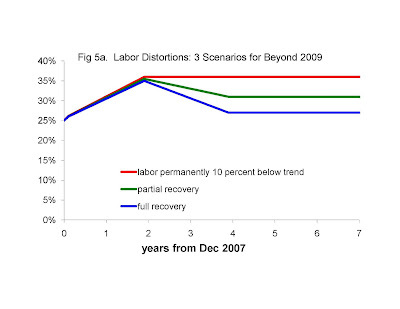 Section V of this paper examines three events that happened during this recession, for the purpose of determining whether the outcomes confirm the paradoxes rather than showing significant resource reallocation among competing uses of the economy’s output. 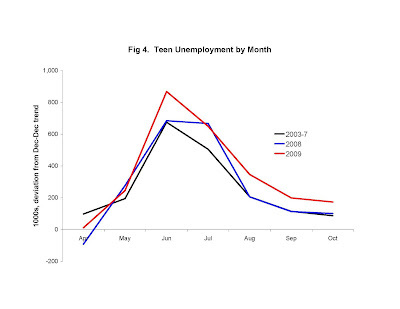 Those events are: the labor supply shifts associated with the annual seasons, the minimum wage hike of July 24, 2009, and the collapse of residential construction spending. 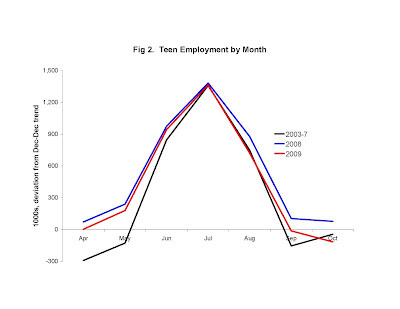 The academic year concluded twice during this recession, and both times over a million teens entered the labor market. Well over a million of them found employment, and as a result total employment for the economy was significantly higher in July than it was in April. This pattern reversed itself the two times that the academic year resumed during this recession. The real federal minimum wage was hiked at the end of July 2009 from an already high level relative to the CPI. 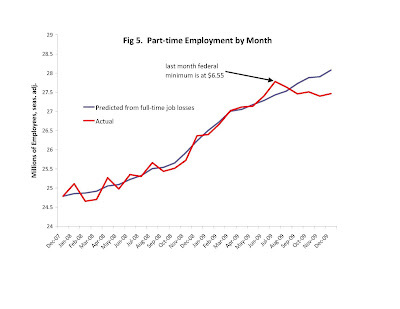 Employers of part-time workers appeared to respond by significantly cutting part-time employment after July 2009, despite the fact that part-time employment had trended strongly up prior to the hike. 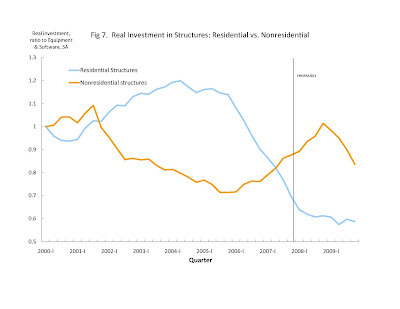 Finally, the collapse of housing construction served to shift resources into non-residential building. Despite the presence of perhaps the deepest recession of our lifetime, and nominal interest rates on government securities that were essentially zero, these three episodes show how factor markets seemed to behave as if output prices were flexible at the margin. In particular, markets absorb an increased supply of factors of production – even during a recession like this one – and do so by increasing output. It would seem, then, that government spending crowds out private spending: the government spending multiplier is less than one. Nothing about my results implies that this recession was efficient, or that government spending necessarily reduces efficiency. 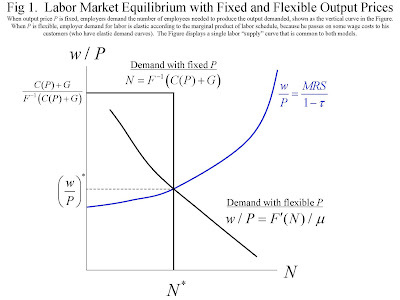 Indeed, my “flexible price model” includes a distortion in the output market and a distortion in the labor market. As noted by Woodford (2010), the presence of distortions by itself does not tell us whether government spending stimulates private spending, or how output responds at the margin to factor supply shifts. This is not to say that output prices were actually flexible during the recession, because producer entry and exit and a variety of other market mechanisms could have many of the qualitative effects of flexible prices. Moreover, even if it were shown that output prices actually were flexible during this recession, that does not preclude the possibility that those prices would be inflexible in response to smaller shocks. But, for the purposes of this recession, models that feature fixed output prices have been a poor description of actual events in the real economy. What is the basis for this claim? 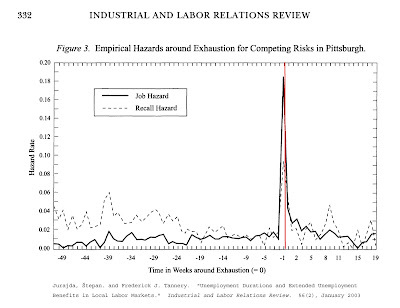 I'm not sure, but Professor Shimer kindly pointed me to an article about unemployment duration in Pittsburgh 1980-85. Unemployment rates got quite high in Pittsburgh in those days, reaching 16 percent at one point, and staying over 10 percent for two and a half years. The chart below shows some of the results. It graphs weeks from unemployment benefit exhaustion against the fraction of unemployment people either finding a new job or being recalled to a previous job in that week. "Exhaustion" refers to the time when benefits cease being paid to the unemployed person, regardless of whether they have found a job. Almost no one started working during the 2-3 weeks prior to the exhaustion of their unemployment benefits (weeks "-3" and "-2" in the chart). Miraculously, more than one quarter started work a week later (19% started a new job, 10% returned to a previous job). Economists agree that a huge reason for this behavior is that people are more willing to remain unemployed when unemployment itself generates a paycheck. (The job they take may not be great, but the data show that often there is a job to take). If incentives mattered in Pittsburgh in the early 1980s, why wouldn't they matter in the United States today? 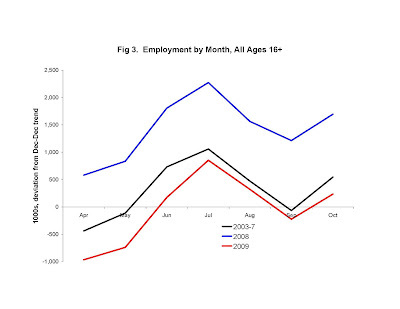 Or why did employment increase almost 1,000,000 last summer? For more evidence that supply matters during this recesssion, see this paper. Often I see bloggers say that expected inflation is low, because treasury securities have similar yields regardless of whether they are indexed for inflation (inflation adjusted Treasury securities are called "TIPS"). We have discontinued the liquidity-adjusted TIPS expected inflation estimates for the time being. The adjustment was designed for more normal liquidity premiums. 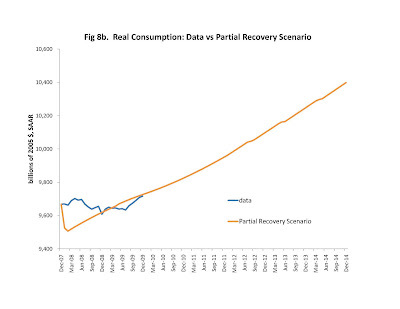 We believe that the extreme rush to liquidity is affecting the accuracy of the estimates." I have always understood the federal mortgage modification fiasco to be a bipartisan effort -- it was started by Bush's FDIC and expanded by Obama's Treasury. But Bloomberg reports today that Republicans are quite critical of Obama's plan. The article says that 2.82 million homeowners lost properties to foreclosure in 2009. The other thing I learned from the article is that Treasury may soon make the federal modification plan mandatory before any mortgage collateral can be foreclosed. That's too bad, because I thought the only hope for the program was that it was so bad as to be ultimately ignored (see the my "Foreclosures, Enforcement, and Collections under the Federal Mortgage Modification Guidelines"). The elderly receive a large amount of government assistance – an amount that is not commensurate with their numbers. The total annual income in the United States (national income, as economists call it) is about $12.5 trillion, or about $40,000 per person per year. The egalitarian view of government is that it taxes persons with annual incomes more than $40,000, and pays benefits to persons with less than $40,000, so that those with incomes less than average could enjoy living standards closer to the average. For reasons that I began to explain last week, our government actually does the opposite. The vast bulk of government spending goes to the elderly, whose average living standards are significantly above $40,000 per year. Social Security, Medicare and government employee retirement (federal, state and local) are government funds paid to people aged 62 and over (aged 65 and over, in the case of Medicare), and total about $1.5 trillion in the current fiscal year. Annual Medicare spending is $12,000 per person aged 65 and over, and growing. Annual Social Security and government employee retirement payments are $21,000 per person aged 62 and over. Medicaid, hospital and other public health programs are open to persons of all ages, although those programs spend more per participant on the elderly than on the others. I estimate that, on average, these health programs are annually spending $7,000 per American aged 65 and over. Combined, the public pension and public health programs are spending an average of $40,000 per elderly American per year. Thus, even if elderly Americans could rely on no other income source, on average they could have living standards of $40,000 per year. Moreover, many of the elderly have significant private incomes and wealth in their homes, which means that elderly average living standards actually far exceed $40,000 and thereby exceed the living standards of the average American. How is it possible that so much government spending goes to persons with above average living standards? This is one of the great puzzles in economics and political science. Some (including commenters on last week’s blog entry) have argued that elderly Americans vote more frequently, and with more attention to Social Security and health policies. However, that does not explain why non-democratic governments – where leaders were not chosen by free and competitive elections – also pay at least as much to their elderly citizens. Another explanation is that the marketplace is far from egalitarian, and it is difficult for the government to be much different. If a family thinks it is appropriate for grandfather to have a higher living standard than his grandchildren, then they probably would not support a government that attempted to reverse that pattern. The question for the future of Medicare is this: Are families ready to triple their spending on the health care of their highest-income members? Today Professor Krugman claims that there is no model saying that "fiscal expansion does nothing but shift money around." He is incorrect about the existence of such a model. In fact, the model has been featured for 25 years in various undergrad editions of Macroeconomics by Robert Barro (Professor Barro is the world expert on government multipliers -- funny how Professor Krugman neglected to check there). Here's how it works. Citizens have preferences u for working (n is the amount of time they work), consuming private goods c, and consuming goods g provided by the government. More goods c + g are produced when the citizens work more according to the production function F(n). 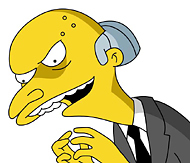 The governments gets its revenue from lump sum taxation. The marketplace sets wages and prices to provide the efficient amount of work and private consumption, taking as given the amount spent by the government. In mathematical terms, (c,n) solve max u(c,g,n) subject to c + g = F(n). When the government is purchasing things (say, health care, or schooling) that citizens would have purchased themselves, then the public spending g is a "perfect substitute" for private consumption c, and the effect of g is just to reduce private spending dollar-for-dollar. In other words, the multiplier in the perfect substitute model is zero: fiscal expansion does nothing but shift money around. Of course, reality is more complicated than this. But (a) by definition, a model is not reality -- and my claim so far is just that (contrary to Krugman) a well-known model does exist that says the multiplier is zero, and (b) "realistic" deviations from this model could well give you a negative multiplier -- that is, government spending reduces private spending more than dollar-for-dollar, thereby reducing total spending. Thus the zero multiplier is one natural place to start, which is why Professor Barro started there in his famous WSJ oped (for rhetorical reasons, my macro courses start with a positive multiplier model: Professor Cochrane ignored my advice on this). Of course, one can argue which model is more appropriate for application to our economy (guess what -- I will not agree with Professor Krugman there either -- more on that in the next few weeks. See also a fancier version of the perfect substitutes model that explains well what has happened our economy so far, and offers a forecast of where it is headed), but you have to understand that Professor Krugman's macroeconomics commentary deliberately treats mainstream macroeconomics as if it never existed, hoping that his faithful readers will not fact check him. The great irony here is that the model above also appears in a paper by Professor Woodford, and adored by Professor Krugman, with one deviation: Professor Woodford's model assumes that government spending is intrinsically worthless whereas the Barro model (above) assumes that citizens actually like government spending, perhaps as much as their own spending! Thus, in addition to misleading you about the macroeconomics literature, Professor Krugman's case for the multiplier secretly rests on an economic logic that requires his beloved government spending to be intrinsically useless! 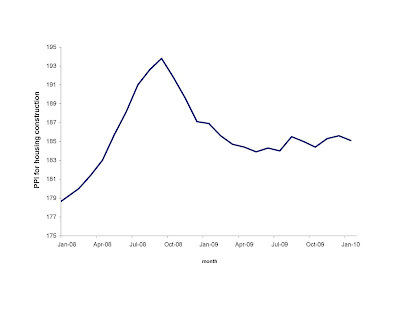 Here is an update through 2009 Q4, with some state-specific delinquency rates. Aside from Medicare, federal, state, and local government annual spend almost $700 billion on public health. They spend another $100 billion on veterans benefits (hospitals are a big part of that, too). Participants in those programs are of all ages, and the elderly participate in proportion to their share of the population, but program costs are a lot more per elderly person than for the rest. The House Ways and Means Committee reported in its Green Book that, for example, about a third of Medicaid spending was for persons aged 65+. There are 38 million people aged 65+, so from these programs alone persons aged 65+ are getting almost $7,000 per person per year. Tomorrow I will show how that $7k combines with other government programs for the elderly. TOTAL = $1.466 trillion. If S & L retirement were assumed to have grown FY 2007 to FY 2010 at the same rate as Federal retirement, then replace the FY 2007 $167 billion with $192 billion for FY 2010 and get a total of $1.491 trillion. Means-tested mortgage modification punishes people for having high incomes, and rewards them for having low incomes. I have pointed out that this may cause home owners to reduce their incomes, and think twice before making efforts to increase them. Technically, a mortgage modification offers (immediate) payment reductions on the basis of the prior year's income. A number of economists have told me that this kind of means test would not affect the supply of income, because at the time of the modification, it is too late to go back and change one's prior year income. This argument is easy to disprove by contradiction. Recall that personal income tax returns are filed in April, and the tax owed (or refund received) with the return depends on income in the prior calendar year. So, according to the above logic, the personal income tax does not affect the supply of income because, when taxpayers have to write the check to (or cash the check from) the IRS, it is too late for them to go back and change the prior year's income that determined the amount of the check. The food stamp program is means-tested -- the more income a family has, the less food stamps it gets. Again, there is a lag between earning and benefit reduction. One common scenario is that the family files a quarterly report indicating its income for (some part of) the quarter, and that report is used to determine food stamps to be allocated in the following quarter (states vary in the timing details). By the above logic, food stamps' means test would not affect the supply of income of program participants because it is too late to change their previous quarter's income. For most of the U.S. history of social security (and all of the history of many other countries), social security benefits were determined as a function of the elderly beneficiary's earnings: the more he or she earns over the limit, the less benefits paid. Again, the benefit reduction occurs in the following year. By the above logic, the work decisions of elderly people would be unaffected by the social security earnings test because, by the time benefits are paid, it is too late for the beneficiary to adjust his or her prior year's income. As a matter of economic reasoning, you probably see that incentives would likely matter even when the cash flow consequences follow the incented behavior with a lag. But my point here is not about economic reasoning -- it's about empirical findings. A large literature has found that the income tax, means-tested subsidies, and earnings-tested subsidies all reduce the supply of income, despite the fact that the cash flow consequences of that supply follow with a lag (yes, economists argue about the magnitude of these responses, but they all admit that some kind of response is there). What is remarkable is that economists have debated and written about marginal tax rates for decades, yet this "lag" issue was never raised as an excuse for high marginal tax rates -- until now. What is it about my exposition of incentives that finally elicits this reaction? Am I guilty of explaining things too clearly? 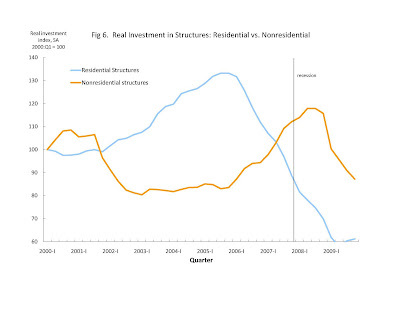 Higher nominal housing prices would improve economic efficiency, and the costs of construction are an important determinant of housing prices. The chart below shows how construction costs stopped falling in the first half 2009, but that the increase since then has been minor. Today's BLS estimate of Jan 2010 construction costs did not add to the increase. 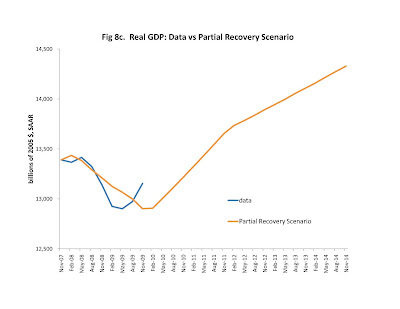 The Federal Reserve Bank of San Francisco is forecasting real GDP to grow almost 4 percent per year for the next 3 years, whereas I am forecasting 2.5 percent per year. I am not sure what exactly they mean by "output gap," but whatever it is they expect it to disappear by the end of 2012. I think it will be many years (more than 7) before employment per capita returns to pre-recession levels or real GDP returns to the pre-recession trend line, so that is the primary reason why our forecasts differ. I even gave a reason last week why my 2.5%/yr might be too optimistic. 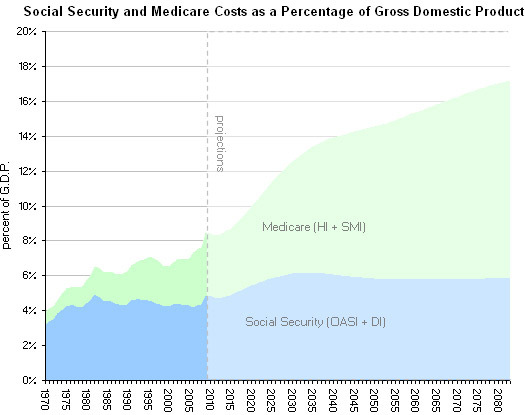 Social Security and Medicare combined already spend over a trillion dollars a year but, under current law, are projected to spend much more than that as the Baby Boom generation retires. For many years, I have expected that laws would change in the direction of levying more taxes, but a couple of recent political developments suggest that benefit cuts are real possibilities. Over the years, Baby Boomers have expressed concern that, thanks to their large numbers, the government would be unable to afford the same pensions and medical care that earlier generations of retirees enjoyed. However, economists have always pointed out that the same benefits could be afforded merely by raising the payroll tax a couple of percentage points. Right now the combined employer and employee payroll tax for Social Security and Medicare is about 15 percent of payroll under the earnings limit. The 18 or 19 percent rate needed to pay for the Baby Boomers’ retirement would depress the economy a percentage point or so, but would still be far below the payroll tax rates of 40 percent or more that prevail in many European countries. Indeed, much of Europe has already seen its population age to a degree that is still decades in the future for the United States. This means many European governments have more retired people to support. What’s more, they have also begun spending more money per retired person. It seems that retired people have been a successful political force around the world, and as their numbers grow they only get more successful. Their political success even seems to extend beyond democratic governments, as a number of public pension programs were installed and generously expanded by dictators in Chile, Spain and the Soviet Union, to name a few. For some reason, the political voices of the young are not so easily heard. In our own country, both Democrats and Republicans have spent generously on retired people. The Social Security program was created under Franklin Roosevelt. Most recently, President George W. Bush significantly expanded the Medicare program to cover prescription drugs. These are some of the reasons I have long suspected that more government support for the retired was on the horizon, to be financed by higher payroll taxes. But three things happened in the last 18 months that might make benefit cuts politically viable. In 2008, the housing and stock markets collapsed, which will likely delay many retirements, and thereby reduce the number of years that Baby Boomers are ultimately retired. In other words, the ranks of the retired may not grow as much as we once thought. President Obama’s election, also in 2008, was another important event. Although Democrats and Republicans vigorously debate his policies, they all admired (and will attempt to imitate) his fund-raising acumen. As The New York Times wrote that year, “Obama Recasts the Fund-Raising Landscape.” In particular, the Obama campaign took advantage of technology and young people to help gain victory. The AARP has long fought for campaign finance limits. Thus, the recent Supreme Court rejection of government bans on corporate spending in elections was another notable change in the political landscape. With slower growth of the retired population, politically active youth and businesses freer to spend cash on campaigns, it is actually credible that businesses and young people might inflict noticeable political damage on a candidate who aims to pay for retirements with higher taxes, and help defend a candidate who considers Social Security or Medicare benefit cuts. A report says that a very large number of commercial real estate loans are underwater, and commerical mortgage modification is on the horizon. Undoubtably, that modification could be "means tested" in the sense that successful businesses would be ask to pay more, and means tests are expected to reduce economic activity. (On the other hand, commercial mortgages might be large enough that lenders could gather the necessary information about borrowers, without having to use borrower income as a proxy). However, consumer spending and business investment seems to be too high right now to reflect an expectation of widespread layoffs in 2010 or 2011. That's why I have concluded that labor is about close to the bottom now, and GDP has already hit bottom. President Obama's policy differences with Republicans (and theirs with him) are few. Of course, their rhetoric is different, but rhetoric is not policy. Democrats and Republicans are like Coke and Pepsi: they spend a lot of effort marketing their purported distinctions, while the chemists (like me) say that they are producing almost exactly the same product. Oct 20 2008: "Do not Read This Until Nov 5"
Oct 21 2008: "The Rhetorical Gap far Exceeds the Policy Gap: Further Evidence and Interpretation"
Jan 5 2009: "Flashback: The Rhetorical Gap far Exceeds the Policy Gap"
Jan 26 2010: "Flashback to 2008: The Rhetorical Gap far Exceeds the Policy Gap"
Today's example is about terrorism policy, one of the areas where the D-R rhetorical gap is especially large. Weather permitting, the America’s Cup Yacht Match will be sailed today. Said to be the oldest active international sporting competition, the nautical tradition is an interesting case of how lifestyles can adapt to changing technologies, amid controversy, without government or court intervention. As it has in many areas of life, sailing technology is dramatically different today than it was 100 years ago, or even 30 years ago. Thanks to the development of lightweight materials and design innovations, multi-hulled sailboats exemplify some of that progress. Unlike the more traditional mono-hulled sailboat that stays upright with its heavy keel pulling it down into the water, a multi-hull stays upright without a keel by having a wide platform (a “trampoline” in sailing jargon), with each edge supported by its own narrow hull. The multi-hulls sit on top of the water, and thereby have much less contact with the water to slow them down. Although once considered dangerous (prone to capsize, especially when the wind blows too much for the width of the boat), multi-hulled sailboats are now highly popular rental boats among Caribbean and Mediterranean amateur sailors and vacationers. Despite, or perhaps because of, their great speed, multi-hulled sailboats are still rejected by some of traditional sailboat racing associations. The 2010 race will be the first time in America’s Cup history that the match occurs between two multi-hulls. Changing sailing technology has raised many disputes about what is “fair” in the sport, and the preparations for this year’s (and prior years’) America’s Cup race were plagued with those disputes. There is little reason for the America’s Cup to have a monopoly on determining the fastest match-racing sailboat in the world. New Zealand, France and other sponsors might create their own matches with their own rules, and the market – that is voluntary participation by fans and racing teams – would determine the “best” set of rules in the sense of encouraging participation and successfully branding its winner as the fastest match-racing sailboat in the world. Yesterday’s Super Bowl had a similar precedent: It began as a contest between rival American football leagues that disagreed about the “best” rules and style of American football play. Two entrepreneurs in California have shown that economic competition among contests can work in sailing too. A couple of years ago the mono- vs. multi-hull dispute arose in the annual Newport-to-Ensenada International Yacht Race. The organizers of that race said that one type of multi-hull was too dangerous, thereby raising the event’s insurance costs and potentially distracting fellow racers who might have to interrupt their ocean voyage to assist the crew of a capsized multi-hull competitor (organizers also had disputes as to the handicapping of some of the multi-hulls). Many of the participants disagreed, insisting that fast boats are the best way to attract the next generation of sailboat racers, and that new satellite-tracking technology allows the crew of a capsized vessel to take care of themselves without halting other racers. Last year, two of those participants, the businessman Bob Long and the multi-hull designer Randy Reynolds, started their own racing organization and “Border Run” race from Newport Beach to San Diego. The race welcomes all kinds of boats, implementing new safety and distress rules to manage both insurance costs and the variety of challenges that the diverse armada might encounter. The racing organization has a system for handicapping member boats, which include multi-hulls. A bold idea is not the same as a successful product, but so far the Border Run has passed the market test: More than 100 raced in 2009 and organizers have already received 140 entries for the April 2010 race. So the mono- vs. multi-hull dispute was settled in Southern California without legislation, judge or jury. He's a legend with a great TV show, but you may disagree with what #99 says about the labor market. Interestingly, everyone quoted in the article seems to have at least some appreciation for freedom -- not the author, though. Women a Majority, but for How Long? Today's New York Times has more on the fraction of market jobs held by women. This summer, that fraction (as measured by the establishment survey; the household survey still show more men employed) will likely fall back below 50%, but the article (and my blog post) say that the percentage will remain high for a long time. It will be high over the next several years, perhaps exceeding 50 percent again. But 15 or 20 years from now, it could be a lot lower. To see this, you have to understand why women increased their market work so much. Microwaves and dishwashers are not going away, and they make it easier to both work in the market and take care of the home, but the main reason why women worked in the market so much more in the 1990s and 2000s than they did in the 1960s and 1970s is the WAGE STRUCTURE. Everyone still has their gender, but other characteristics like education, IQ, etc., became much more important as a determinant of productivity in the work place. Liberals lament this change in the wage structure, not realizing how it transformed women's lives. But inconvenient truths are beside the point here, which is that the wage structure of the 1990s and 2000s is not permanent. Eventually (I have been waiting twenty years for this response, so don't expect it overnight!) the supply of human capital will respond to return the wage structure to something more like it was in the 1960s and 1970s. When that happens, education, IQ, etc. will not command such a premium, and cease to be so important relative to gender. Then the fraction of market jobs held by women will be much less than 50 percent. Read more about this in my QJE article with Yona Rubinstein. For the first time, women have outnumbered men on the nation’s payrolls. The Labor Department revised on Friday its previous estimates of nonfarm payroll employees, the monthly aggregate employment series that gets the most media attention. The most recent jobs estimates by gender are for January. Before adjusting for seasonal changes, 64.2 million payroll employees last month were women, and only 63.4 million were men. 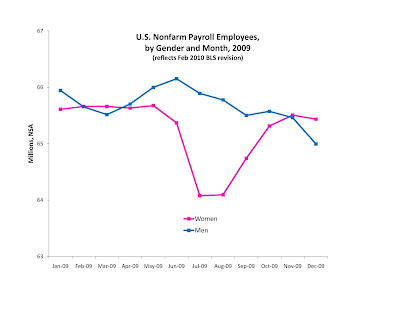 The chart below, taking revisions reported on Friday into account, shows payroll employees by gender for each month of 2009. In four of the 12 months — February, March, November and December — there were more female payroll employees than male employees. Employment follows a seasonal pattern and a somewhat different seasonal pattern for men than for women. 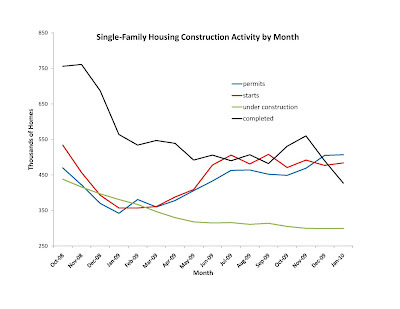 For example, construction is highly seasonal, and construction is more male intensive. So the summer work force is more male than the winter work force, and it is no accident that women outnumbered men in colder months (according to the government’s seasonal adjustments, seasonally adjusted female employment in January was only 49.9 percent of the total). The different types of jobs held by men and women not only explain the seasonal pattern of women’s relative employment, but they also explain why it was a recession that pushed women past this milestone. Construction and manufacturing are male-intensive industries and were industries with particularly large percentage employment losses during this recession. Over the past 24 months, the number of female payroll employees fell 2.6 million, while the number of men fell 5.8 million. In fact, almost all of the gains in women’s relative employment over the last 20 years occurred during the three recessions. This means that a job market recovery and normal seasonal trends could push women back into the minority. Still, the long-term trend indicates that the basic parity between the sexes in the work force is more than a passing moment. 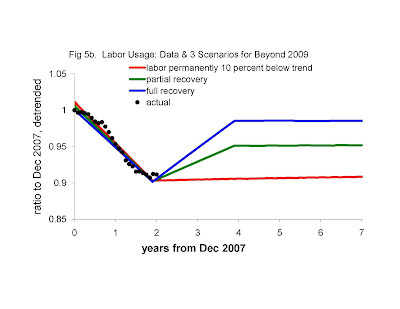 Below is Figure 8a from my NBER working paper #15681. The model predictions (orange series) are exactly the same as I showed it in the NBER wp, and have been showing for a while on this blog. 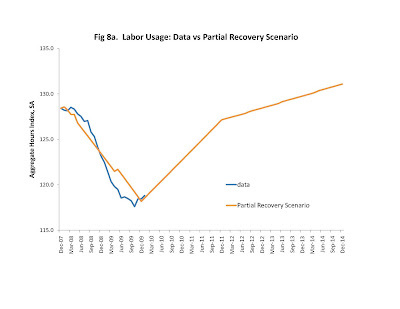 The data series (blue) has been updated to reflect (a) this morning's release of Jan 2010 employment and hours data, and (b) this morning's release of BLS revisions to the data from since April 2008. 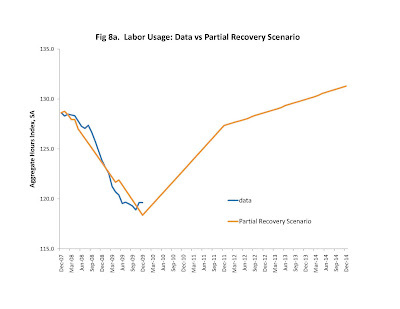 The model was designed to fit the pre-BLS-revised employment and hours data through summer 2009, and this was changed with the revision, so it would be interesting to see the model fit to the BLS-revised data. But it is interesting that the recovery is occurring at very close to the pace the model predicted. Today the BLS revised its previous estimates of nonfarm payroll employees, the monthly aggregate employment series that gets the most media attention. BLS says that 65.435 million payroll employees in Dec 2009 were women, and only 64.996 million were men (these are NOT seasonally adjusted). In fact, the revisions say that women reached majority status in February 2009 (65.660 million to 65.654 million). (Women are not a majority of employment measured by the household survey). I predicted that the payroll workforce had to drop below 131 million for this to happen, in fact it had to drop only to 131.314 million (as it did in Feb). 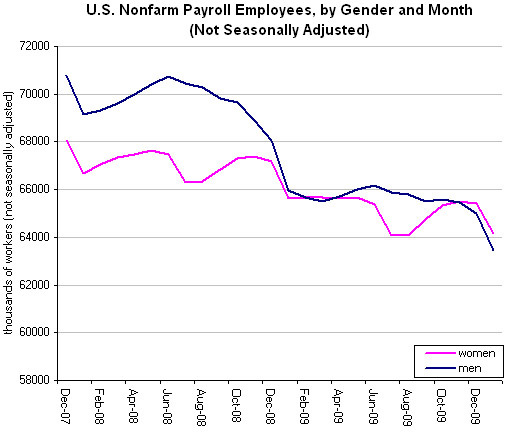 Below is a chart of male and female payroll employment for each of the months of 2009. 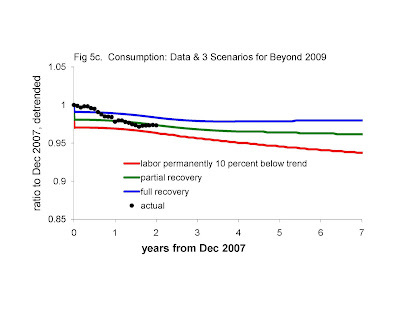 Here is an update of Figure 7 from my Feb 2009 NBER working paper. Of particular interest is the fact that the labor market distortion shows no signs of getting better in Q4. The basic patterns of this recession I identified at the end of 2008 (based on data through 2008 Q3) have continued for 5 consecutive quarters. 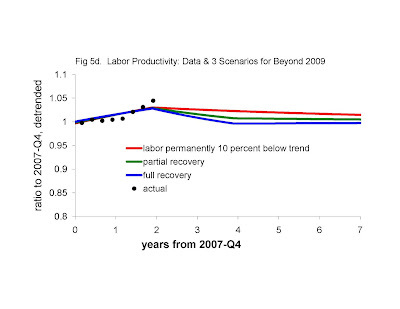 Until the labor distortion turns around, employment could continue down while real GDP rises. The good news is that, based on consumer spending patterns during 2008 and 2009, it appears the labor distortion will stop getting worse in 2010 Q1 (I view consumer spending as a forecasting variable, not necessarily having a causal effect on employment: see my Jan 2010 NBER wp). It appears that payroll employment for March 2009 and subsequent months will be revised down by about 800,000 (bloomberg.com offers a detailed but user-friendly explanation here). That will bring the household survey and establishment survey in closer agreement in terms of percentage job loss through March 2009, although we'll see what the 2011 revision tells us about the rest of 2009. In the meantime, the household survey should get more attention (as I advised here). A New York Times story from yesterday. Large amounts of government debt are sometimes said to harm the economy. But, by some metrics, there is still too little United States government debt. The federal debt recently passed $12 trillion, a $3 trillion increase since 2007, as a result of the unprecedented budget deficits incurred during the last year of the Bush administration and the first year of the Obama administration. The Obama administration expects to add trillions more. With recent federal budgets adding so generously to the supply of United States government debt, it is natural to wonder how many trillions more the marketplace can absorb. In markets, an excess supply is easy to detect: Prices are low. Conversely, high prices indicate a supply shortage, not an excess. Investors continue to purchase United States government securities, despite the fact that they pay them a lesser expected yield than do privately issued securities. Economists have long wondered why investors have such affection for United States government securities, but we agree that the demand for those securities is extraordinary. Judging by the prices prevailing in the market, $12 trillion is not enough to satisfy current demand for government securities. So, despite the recent surge in supply, more government securities would likely improve economic efficiency, not harm it. That’s not to say that government should spend without restraint, or that government spending is cheap because it helps satisfy investment demand for debt. The best way for the government to create debt is to purchase private sector securities (the Federal Reserve moved in this direction when it recently purchased mortgage-backed securities rather than government securities). In this way, it can increase the supply of government debt without spending a lot. Fiscal conservatives who call for tax increases in order to “bring down the debt” ignore the fact that investors are so glad to purchase it (and also ignore the private savings offset I wrote about last week). I’ve said it before and I’ll say it again: Presidents Bush and Obama do not need to apologize for the federal debt, just the excessive federal spending. You may recognize this argument as Milton Friedman's Optimum Quantity of Money, in which he said that government liabilities would, when optimally supplied, pay the same rate of interest (that is, have the same price) as private sector liabilities. Currency is one example of a government liability, a Treasury bond is another. 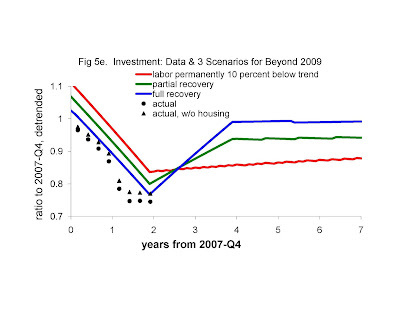 The horizontal axis of Fig 8c in NBER working paper #15681 was mislabeled. The Figure below has it labeled correctly. One sentence in the text relied on Figure 8c; it should now read "Real GDP has probably hit its lows, and Figure 8c shows that its growth rate through 2011 is expected to be 2.3 percent per year...."